Providing cost-effective technology for warehouse inventory management and order fulfillment solutions. 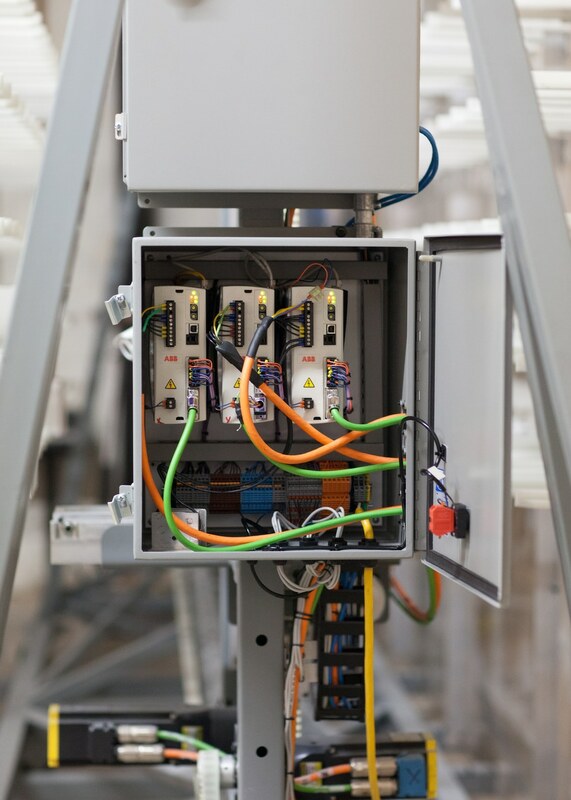 Voodoo offers a unique lease-based Pick-to-Light system designed to modernize warehouse operations by leveraging the latest IIoT (Industrial Internet-of-Things) technology. The picking hardware integrates effortlessly with existing WMS (Warehouse Management Systems), or ERP (Enterprise Resource Planning) systems allowing distribution centers, warehouses, and 3PLs (third-party logistics) to scale operations, only paying for the lights needed each month. This revolutionary approach to leasing Pick-to-Light devices on a month-to-month, pay-as-you-go basis avoids long-term commitments and costly up-front fees. Voodoo Robotics, the leading innovator in picking warehouse automation, provides cost-effective technology for warehouse inventory management and order fulfillment solutions. With engineering and robotic expertise, we are bringing the next wave of state-of-the-art automation to material handling industries. Voodoo Robotics is a proud member of MHI, the nation’s largest material handling, logistics, and supply chain association. 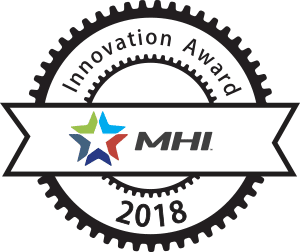 MHI offers education, networking and solution sourcing for members, their customers and the industry as a whole through programming and events. Our Cloud Display Devices are engineered to stir a revolution in the warehouse! They’re nothing like previous generations of Pick-to-Light: No huge up-front investments or complicated ROI. No complex wiring, and no huge support contracts. These devices are a snap to integrate with existing WMS or WCS systems using a simple URL. You can even connect them to your existing spreadsheets! 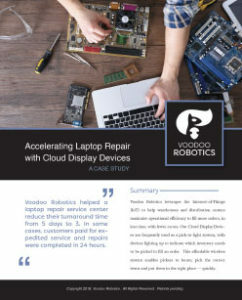 Voodoo Robotics helped a laptop repair service center reduce their turnaround time from 5 days to 3. In some cases, customers paid for expedited service and repairs were completed in 24 hours. The Window Outfitters was seeking a solid, yet affordable Enterprise Resource Planning or Material Requirements Planning system that would easily integrate with their complex manufacturing process. 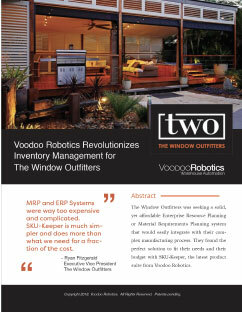 They found the perfect solution to fit their needs and their budget with SKU-Keeper, the latest product suite from Voodoo Robotics. 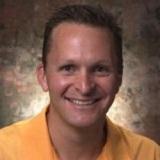 Voodoo Robotics pushes the envelope with their low-cost SKU-Keeper warehouse inventory management system. 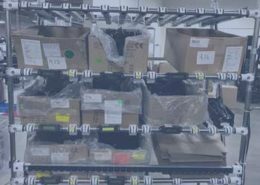 They’ve replaced the Software as a Service (SaaS) model with a leased Hardware as a Service model for warehouse picking and inventory management. Voodoo’s proprietary “pick assist” modules are simple, reliable and easy-to-use. These modules are connected to a robust web-hosted inventory management system and integrated with your smartphone or tablet. Voodoo is years ahead of the competition. 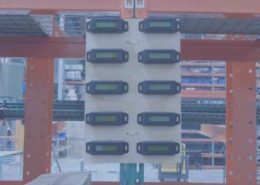 People using this technology in their warehouses and distribution facilities will find the system reliable and inexpensive. We like to call that a “no-brainer” decision around here. 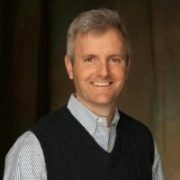 I believe that the foundation of the Voodoo solution will change the way we look at Automated Retrieval Systems, the scalable and adaptable nature of the Voodoo solution means that supply chain managers can implement a system that supports their business processes instead of implementing business processes that support the ARS solution. This scalability promises to increase the velocity of supply chain pick operations while also decreasing their cost. 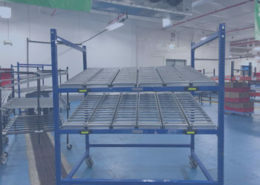 Further this scalability allows firms a low risk, modular, time-phased, and cost effective way to redesign portions of their supply chain warehouse operations. Further the Voodoo solution supports leading edge firms who are looking closely at the supply chain risk reduction associated with re-shoring decisions–the Voodoo solution promises to be an integral part of labor efficient manufacturing and assembly operations. “In regards to Voodoo Robotics warehouse technology and system, I find the ease of use of the SKU-Keeper to be nothing short of amazing. Every level of an organization can realize benefits from its implementation into the ordering, management, warehousing and picking functions. As a previous Program Director and Business Manager for Overseas Operations Support Contracts, I can immediately see the costs and time savings from this system and especially the simple-to-use tags. The ability to track inventory (in real-time) from any location in the world would have given my stateside purchasing departments and senior management an accurate look at what was happening on the ground twelve time zones away. Using this system, a few minutes at the computer allows supervisors in the shop to work with the people on the floor enabling them to do spot inventory checks for accuracy purposes. This allows for better tracking of parts/supplies, greater accuracy in inventory holding costs, and better support to the end customer, which is the reason we are there in the first place. I like the ease with which the tags can be set up, configured and moved from location to location based on the needs of the field. Temporary and semi-permanent warehouses are how things are done, more often than not, in fluid locations. The simple ability to move the tags to the inventory is a real time saver for pop-up warehouses that may only last a few days or weeks. The display system that lights up and sounds an audible tune is a huge benefit for the people looking for the items in a fluid environment, especially in low light and critical conditions. 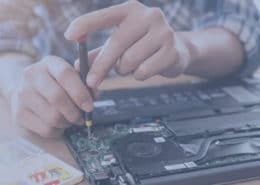 Being able to bring a new employee quickly up to speed on finding the right parts to pick is an extremely valuable feature. No need to spend hours/days educating them on a warehouse layout. Employ the system and let them go out to the lighted, audible displays to get what is needed, quickly. Also, the scalability is very flexible. 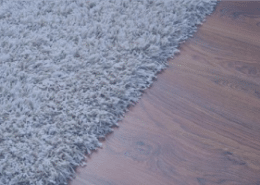 If the number of line items expands, add more battery powered tags to absorb the requirement. I wish the SKU-Keeper would have been available at my last two locations. The number of labor hours that could have been saved is difficult to imagine. The amount of holding costs on items that were not turning but could have, would have greatly increased profitability. The increased level of service to the end customer and ease of verifying metrics are what was needed. My next overseas location will have this system”.